In case you haven’t heard of Big Boy Bloater (the moniker is derived from a nickname at school), he was born in Farnham, Surrey in 1971 and took up the guitar aged 11. He was heavily influenced by his father’s great love of music. “Our house was always filled with rock & roll, 60’s hits and basically anything and everything. My Dad still loves music to this day and he has no boundaries, it’s just good or bad music to him which has been a great lesson in life.” Playing in bands at school from the age of 13 Bloater soon realised he could earn pocket money playing in local pubs and clubs. He made such an impact over those early years that, in 2008 Radio 2 royalty, Mark Lamarr put his own money behind a limited-edition vinyl release of one of Bloater’s tracks. His last album, Luxury Hobo, was a masterpiece of dark and personal blues reflecting the difficulties he had recently been through. His new album, Pills, is equally personal but finds him in a better place, as he says “Maybe after the depression, my minds a bit more open and turned on to things, so I have observed more.” Thankfully, the music is just as good. 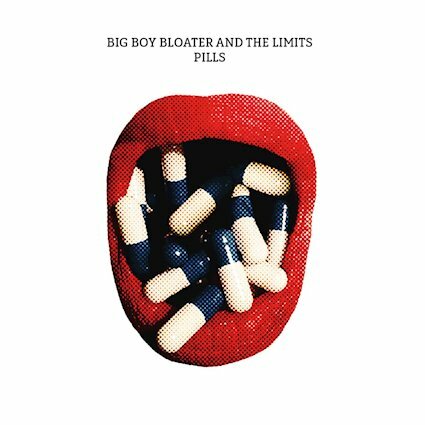 Opening with the title track, Pills is his take on over-prescription encouraged by the drug companies. His guitar welcomes you in with a tantalizingly clever riff, followed by the gravelly vocals in an up-tempo vein belying the subject matter. The solo is a pleasure. The apparently autobiographical Friday Night’s Alright For Drinking starts with a dirty bass riff and then delicious slide takes you into the song and he is joined by backing vocals for the fun chorus. A rapid-fire snare and delightful swampy riff take us into the foot tapping and yet bleakly observant Saturday Night Desperation Shuffle. Another clever solo is backed by a classic and brilliant ascending/descending bass line. Next, a surprisingly poppy feel is in evidence on Stop Stringing Me Along with a strummed acoustic background and backing vocals which evoke a kind of Tom Petty feel. Lyrically his cynicism with the music industry’s powerbrokers is rife with humour as well as cutting commentary. It is the weakest track on offer, but still a pleasure. Unnaturally Charming hints at BBB’s love of horror films as the lyrics reveal a storyline that would make a decent psychological thriller. Next is Slackers Paradise and a change of texture with a warmer guitar sound and yet another brilliant bass line. This isn’t blues per se; it is a portmanteau of genres, which includes a hint of soul and funk layered on top of an almost tropical feeling. A great solo rescues it from falling into pastiche. Mouse Organ sounds as if should be a Tom Waits cover. It isn’t: it’s a slow paced, beautifully realized piece which defies a label. It shouldn’t work, but it is a treat to listen to and the dobro slide solo is so understated and clever (apart from being far too short). Oops Sorry is straight out of a 1960s dance hall. Again, the lyrics are filled with his humour, suggesting a broken heart can be fixed with gaffer tape and super glue! She Didn’t Even Buy A Ticket is another ‘based on a true story’ song: “It happened at a gig,” he remembers. “Someone actually gate-crashed looking for her husband, who was out on a date with another woman.” This also has a 60s feel with its backing guitar sounding like the Kinks were in the band. Then, midway, through the Kinks are replaced by the Troggs for a heavy central section. This is another strange one in that its disparate parts shouldn’t work so well, but I love it, so it must. This Ain’t Rufus opens with a Chuck Berry style intro and then the guitar follows the vocals. The solo is great, sounding like an amalgam of Berry and SRV if that were possible. The Digital Number of the Beast is a funk/soul marriage with the blues as best man. 1010011010 is the number he refers to as he pours his ire on silicon valley. The final track, A Life Full of Debt, concludes the story of the Swamp Monster from the previous album. This is a stroke of genius as, despite the upbeat tempos preceding it, the album closer is a poignant ukulele led treat. No histrionics, just a gentle, complex and satisfying little ditty. Do not expect a straight blues or rock sound, this album is a melting pot of ideas based in blues but encompassing so much more. Bloater’s dark humour and personal experiences add colour and depth to an album which can make you sad but more often will make you smile knowingly. A special mention must go to Matt and Steven for their considerable input and quality backing. Thoroughly enjoyable.